The server displays a status window while it is running. If you close the status window then the server shuts down and the program stops running. The screen shows you information about the feed of messages coming from the receivers, the web server, the state of the control over a UPnP router and the rebroadcast servers. This button controls whether the web server will accept requests from web browsers. When the program first starts up it will automatically put the server online. This button lets you create or remove the port mappings on a UPnP router to allow access to the server from the Internet. The main screen has a hyperlink that, when clicked, will start the web browser and go to a page generated by the server. The three controls above the link let you specify which link is shown. 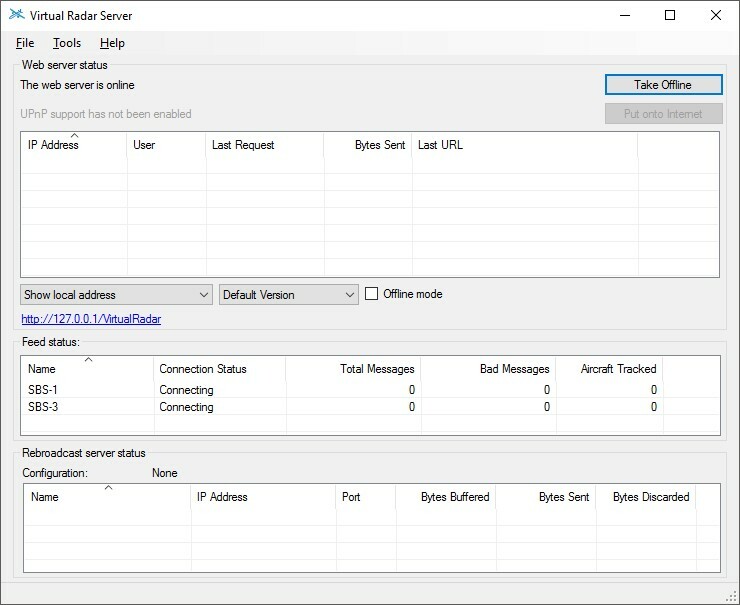 The link can show the address of the server for browsers on the same computer that is running Virtual Radar Server, browsers on other computers connected to your local network or browsers that are accessing the server from the Internet. There are two different versions of the live aircraft web page that can be displayed - the desktop version or the version for mobile devices such as iPhones and iPads. You can also view a version of the page that displays the location of aircraft in a flight simulator. Offline mode can be used to disable the map when you are not connected to the Internet. The unique name given to a receiver or merged feed when it was configured. This indicates the current state of the connection to the feed of aircraft data. Normally the server will connect to the data feed as soon as it starts up. You cannot disconnect from the feed manually. If the connection to the feed goes down for some reason then the program will automatically attempt to reconnect once every second. You can manually disconnect and reconnect to the feed by using the Tools | Reconnect to Data Feed menu entry. You can also right-click the feed to bring up a context menu, from which you can reconnect to the data feed. Double-clicking a feed will display statistics about the feed. The same statistics feed can be reached via the File | Statistics menu. VRS lets you rebroadcast the messages that are received from the data feed in a variety of formats. This list shows the connections to the rebroadcast servers. VRS periodically checks http://www.virtualradarserver.co.uk to see if there is a new version of the program available for download. If it finds a new version then this is indicated in the lower left-hand corner of the main screen. If there are problems with loading a plugin then these are also shown on the status bar.